Transforming therapeutic proteins into high-concentrated, stable and easy to use medications for subcutaneous self-injection can add up to a major challenge along their clinical development. A formulation’s fundamental qualifications such as appropriate physico-chemical stability, container material compatibility and viscosity must be taken into account to support an acceptable in-syringe shelf-life as well as convenience in regard to syringe-ability. However, in order to take all of the requirements to a maximum and develop a pioneering new drug in a pre-filled syringe presentation, a great extent of knowledge, expertise and sophisticated analytics is needed that are sparingly found in this developing market to date. ProJect Pharmaceutics, one of the experts in formulation and process development for parenteral drugs, has specialized in this emerging field with a key expertise in development of stable, effective and syringe-able formulations and their eligible processes. Be it conformation of de novo drug products towards a pre-filled syringe application or transfer of existing drug products into the like, ProJect Pharmaceutics features all the required key qualifications in that field. By applying an elaborate science-based approach to meet well-discussed critical quality attributes such as e.g. maximum effectiveness, high concentration for low injection volume, low aggregate content and low viscosity, ProJect Pharmaceutics offers profound guidance and support on the development of pioneering parenteral biologics. Minimizing viscosity and aggregation by actively maximizing repulsive protein-protein interaction in solution is one of the key techniques used. Additionally, shifting thermodynamic protein stability in solution to its maximum prove another key requisite promoting long-term stability of liquid formulations in pre-filled syringes. Designed formulations’ syringe-ability is measured directly in-system mimicking the typical administration procedure of the patient instead of through viscosity only. In case stability in aqueous solution is found to be limited by the biologic ́s inherent sensitivity freeze-drying clears the way forward. 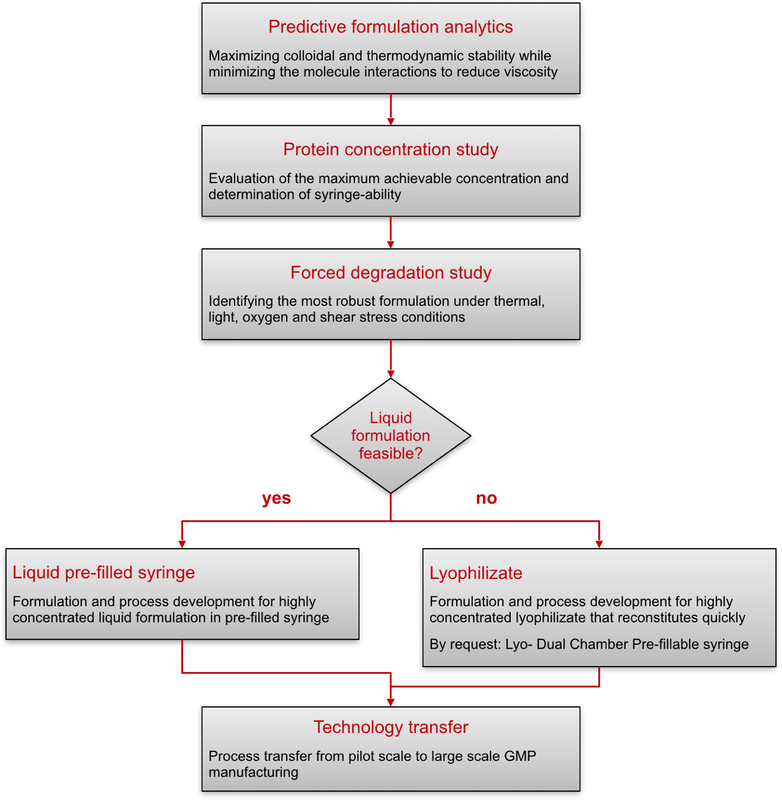 Innovative design of lyo-formulations and freeze-drying processes developed by ProJect Pharmaceutics reliably overcome the hurdles of reconstituting high-concentrated protein lyophilizates. Supply of aseptic pre-clinical study material in pre-filled syringes at pilot scale complete ProJect Pharmaceutics’ excellence as your pharmaceutical service provider in this exigent field of highly concentrated protein formulation development.